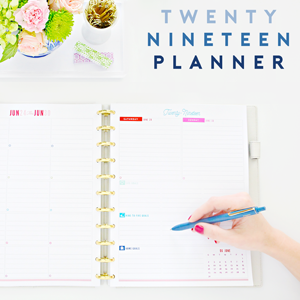 Every year I try to focus on things big and small in relation to our home and organizing solutions. A few years ago I started a series of "Quick Tips", and I always love those posts because they allow me to share really quick things that can be done to make day-to-day life a smidge easier. The solutions are intended to be simple enough that anyone can do them in a few minutes or less. 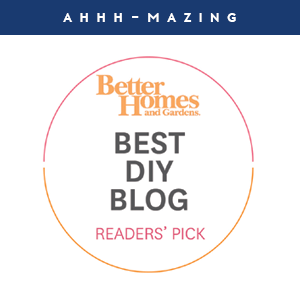 As much as I love those posts, sometimes our projects and what we have going on in our home can quickly take over the blog. And then I forget that there needs to be a better balance of big and small for us all. As a result, this year I am excited to use Tuesdays as a way to celebrate those smaller ideas that typically have big results. Say hello to Quick Tip Tuesday! As I was setting up a temporary kitchen in our guest room to utilize during our renovation, I realized that one of my favorite kitchen solutions has never actually been shared here on the blog. The horror right?! As we made an effort to use less paper towels and chemicals in the kitchen, we began using more rags. For the longest time I would toss the rags into a small vase tucked away under the sink. This solution worked OK, yet it would only be a matter of a day or two before the smell would start and I wasn't a huge fan of lugging a ceramic vase up and down the stairs each laundry day. Then one day I spotted a wet bag while with one of my girlfriends and her baby. I had no idea that these fabulous things existed, where were they when my boys were babes? I asked her all about them, and she let me know that typically they are used in diaper bags to hold wet diapers, wipes, spit up clothes, etc... They also work great at the beach or pool for wet swimming gear. It made me start singing, "Always the last to know..."
Then the lightbulb went off. I wanted one of these fabulous bags under my sink to hold all of our dirty and wet rags until laundry day! I am not sure if all wet bags are created equal, but I purchased this one in the large size (no longer available in pink) and not only does it hold a boat load of dirty rags, it also seems to absorb and lock in the smells! 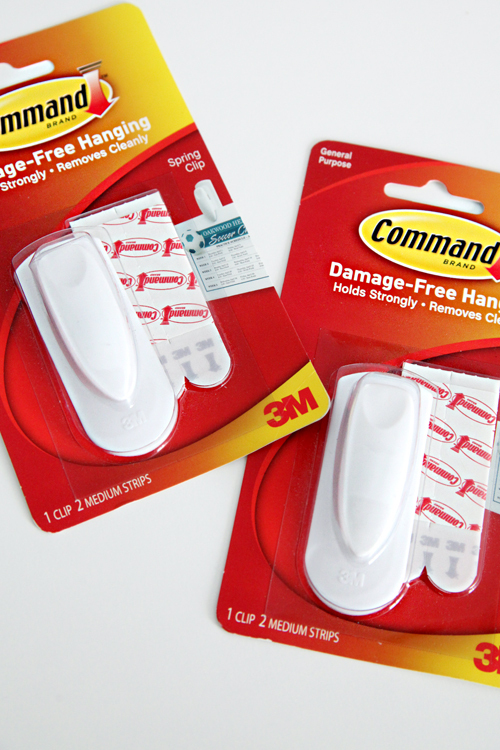 So the tip is, hang one of these delightful bags on the inside of your cabinet door, just under the kitchen sink. 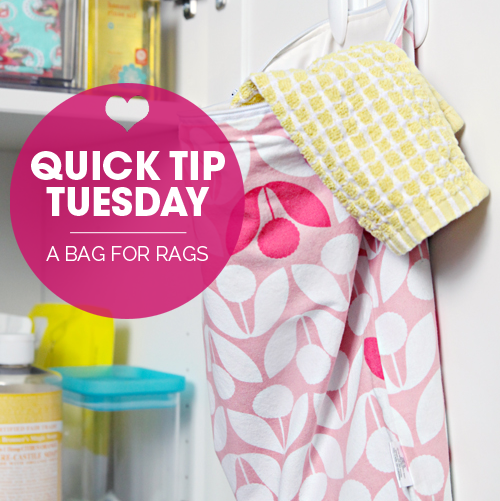 After cleaning or washing dishes, toss the damp/wet rag into the bag until washing day arrives. 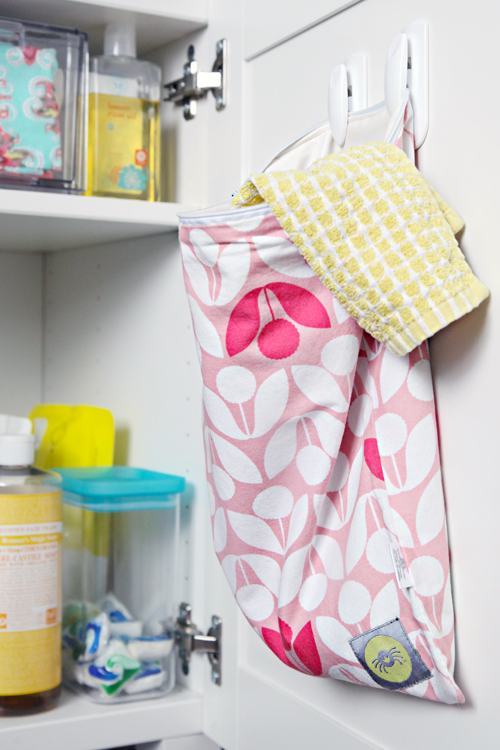 I used Spring Clip Command Strips to hang the bag, but you could also sew a small loop on the back and use hooks. 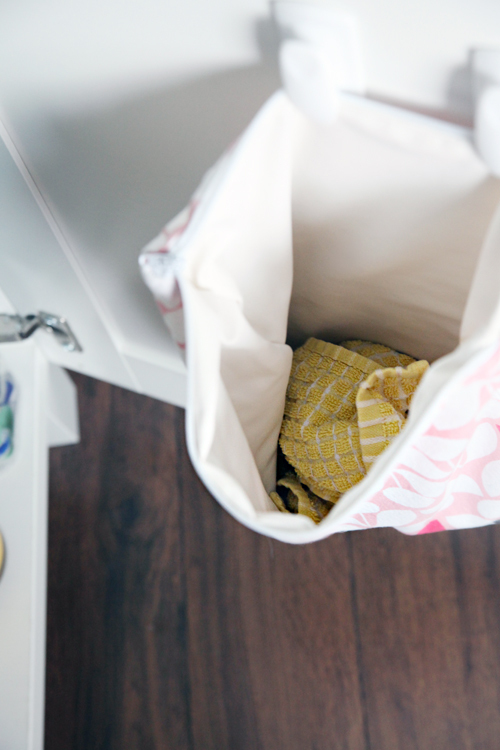 Each week, I take the bag full of dirty rags down to my laundry room, and toss the bag right into the wash with them! I have been doing this forever now and it really has been one of those super quick and easy solutions that make my daily life much more simple! Are y'all excited for more Quick Tip Tuesdays? Psssst! I just looked up my Amazon order and I started using the wet bag at the end of 2012! As you can see in the photos, the bag has held up wonderfully over the years. 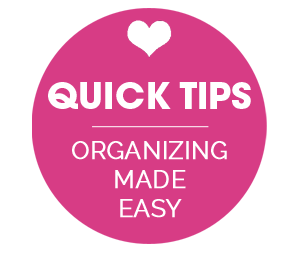 Such a practical idea and I am excited about more "Quick Tip Tuesday" posts! What a great idea and so cute too! i just adore whatever you do ! This is such a great idea Jen! I got wet bags for when we used cloth nappies with my son, and I've been wondering what else I could do with them now that he's well out of nappies! One thing I notice, though, is that the contents inside the bag are not rinsed as well when the whole bag is put in the washing machine... maybe that's just my brand. Do you ever notice this? Thanks for the tip! do those clips hang on well for a long time ? great post. Yes, mine have never lost their spring and I have been using them for years. They also work wonderful for holding rubber gloves under the sink. xoxo! Cool! So you don't care of the colors of the rags are mixed? I wash all of our cleaning rags separately from our other clothing, but I don't worry about rag colors. This so helpful! Thank you! We are big rag users, too, and I have been running the rags down to our laundry hamper. I even have a designated section for the rags, but I like this solution much better! I have been looking for a solution to this exact problem! Thanks for sharing! I love having a wetbag in the kitchen too for all the dirty rags. Having it there has encouraged DH to actually pitch old rags/towels in and start with a fresh one more frequently. :) Before I would often find him using a towel for something gross (like drying off car parts or wiping a sweaty face) only to watch him drop it back on the counter. Gross! I love your plan for Quick Tip Tuesdays. This was a good one. I never know where to put my rags before washing. Can't wait for Quick tip Tuesdays! Great advice and sight! So clever! I've been trying to use fewer paper towels as well. That is so much better than my bucket! Plus they carry these online at Target! This is genius! As long as I've lived away from my parents' house, I've never used rags. My mom uses them all the time and they stink so bad. I've always used paper towels instead. I'd rather use rags to not create as much waste (or spend as much money on paper towels...), but the smell would've really bothered me. I'm about 4 months pregnant with my first baby and have been looking into cloth diapers - I can't believe I didn't put this together! Now I'm thinking or what other wet things could go in these bags. Running clothes, wet towels... I love it! Love the tip! Great idea - as always!! Looking forward to more Quick Tip Tuesdays. I have a quick tip! It's along the same lines as yours and was a solution to our smelly rag situation. We live in a bungalow with an open concept kitchen, living room, dining room. It's one big open space with a hallway that leads down to the bedrooms. Next to the hallway is a landing that leads to the front door/basement and it's a central location in our home. To deal with the dirty kitchen linens in our house, we opted to put a decorative hamper at the landing. It holds all of our dirty rags throughout the day and it is now our family's central clothes hamper too. It has been a great system for us. Dirty kitchen rag? No problem...toss it in the hamper. Dirty PJs or outfit from the kiddo? In the hamper it goes! Oh, hamper is full? Downstairs to get washed, dried, folded and put away. This has simplified our dirty and smelly rag problem and has solved our laundry troubles too. I love the fact that you do not use paper towels! Neither do I! What I do use are Skoy Cloths. You have to check these out - total game changer! They are awesome! http://skoycloth.com/. Yes! We have a few of these - a large one at home for the cloth diapers and a couple of travel-sized ones for the diaper bag. So handy! Never thought to use them as anything else though, so thanks for the tip! I love this idea! I always have small rags and towels that I don't know what to do with. With 2 dogs and a teenage boy, there are always small spills and paw prints that I wipe up. Thanks for sharing!! This s a "light bulb" moment! Just ordered one. Thanks for sharing! What a great idea! I usually have a small pile of rags that need to go down the the laundry room on the floor and this is much, much better! What a great idea! I have one of these bags for pool/beach trips, and it is a lifesaver there so I can imagine it will work great for this too! What a great idea and the perfect solution with the wet bag. I just got one for my baby and didn't even bother to think of other uses but yes this totally works! great idea! i will definitely be getting one of these! also, just curious - how many rags do you keep and how do you use them? We use one of these bags for our dirty cloth diapers. It can really stink inside the bag but it does keep it nice and sealed up! Can't smell anything until we open it and then...yeah. And we wash it every few days! Love this idea! We also use rags instead of paper towels whenever possible. I have a separate little basket in the basement laundry area for all kitchen towels and rags, but my issue is that I want them to be dry before I throw them in the basket. I feel things get too smelly (and possibly moldy!) if thrown in wet! So the question is, do you find the wet bag helps foster mold/mildew growth? Or do you just put dry used rags in the bag to avoid that problem? I love this idea, but am curious to this challenge! I have never noticed any mold or mildew growth inside of the bag or rags. I typically wash everything within a few days, but there have been times where the rags have sat in the bottom for a longer period of time and it really does seem that the smells are just absorbed into the bag, yet the bag always washes clean and never carries a scent. Some rags are dryer than others, but I am not sure that is what makes the overall difference. I love this idea! Although my washing machine is under my sink at the moment so dirty rags just get thrown straight in... scruffy but it works! Really interested in this idea but wonder how the towels/rags smell after washing? If they are put in the bag wet and there is a smell to contain, I am imagining there might be mildew? I can never get a musty/smell out of towels and just wonder what your secret must be! Thanks. Jennifer, you should really consider going back to regular detergent. Homemade detergent is NOT detergent. It's soap and will void your washing machine warranty. There are websites specifically dedicated to proving how bad that stuff really is for your clothes. I suggest you read up on it. The ingredients needed to properly clean your clothes are not available to the public unless you're using a wash board like in the old days. Fluffloveuniversity.com They have scientific evidence to show you exactly why that stuff is nothing but crap for your clothes. Interesting Brit, I will definitely do more research and be sure to check them out. I will admit I am a bit surprised, I have heard for years the endless benefits to using homemade detergents, and our clothes have never looked better. We toss our small amount of powder right into the drum with the clothes to prevent any clogging in our machine, and always rinse with vinegar which is a natural descaler. Our clothes never have an odor, are always soft and colors don't seem to fade. That said, I am always interested in reading pros and cons of all avenues, and never against switching things up. I appreciate the comment! Thanks for the reply and I will be trying out this idea! Unfortunately, the large fan base can be attributed to websites like Pinterest where anyone can post and get millions of hits. The ingredients in those diy recipes usually include a soap like zote or fels naphtha, maybe even ivory. While they're located in the detergent isle, they're not really detergent. They're for spot treatment. Additionally, the other ingredients are just boosters and water softeners. There's nothing really cleaning your clothes. The ingredients are just masking the smell. I know this personally because I used it for three years and then participated in a "challenge" to see how bad that stuff was. I use cloth diapers and as much as no would love to be able to wash my clothes for as cheaply as possible, diy is not the way to go. There are thousands of mothers across the nation that use fluffloveuniversity to help them fix what diy has done to their diapers AND their babies. For example, since the diapers aren't really getting clean, that bacteria sits there in the diaper wash after wash. Eventually, the bacteria starts causing rashes and even worse problems like MRSA. My son actually almost had permanent scarring from the ammonia burns. If you're looking for a cheap, plant based detergent (to "avoid" chemicals) Sun is a great option. Just make sure that you're using hot water to activate the enzymes. Again, all of this can be explained on that website, but I just had to follow up with you. If you don't believe me, I'd love to challenge you to try the same challenge I did. Put all of your towels or pillows in a bath tub in the hottest water possible. Mix in 3 tablespoons borax, 3 tablespoons washing soda, and 3 tablespoons liquid Calgon. Let it sit and soak over night until it cools. The next morning look at your water. The majority of the time, your water will be black. If it doesn't, don't doubt me yet. That doesn't mean anything. But give it a few tries after a regular wash with regular detergent and see if your towels aren't more absorbent. See if they don't feel cleaner. I promise, it will blow your mind. One last thing, the idea of diy sounds so great we often forget about common sense. I did! When you wash your dishes, does a few drops of soap clean all those items? No. So how could a few tablespoons of homemade soap truly clean all that dirt and grime out of all those clothes in all that water? It just doesn't sound right. Because it's not. 3 years later and my clothes were horrible. My whites were dingy, my clothes stunk, and there was soap build up in my machine. Sure, I could clean it out, but I can't clean the tubes that the machine sends it through. Sure I could add vinegar in to get rid of the smell, but why were my cloths smelling anyway? Clean clothes shouldn't smell! Those were signs I was missing that that "detergent" was just destroying my machine and my clothes. Genius idea! I keep my rags in a bucket but this is such a better idea! I need one of these for my boy's bathroom…they go through SO many washcloths. I love it! 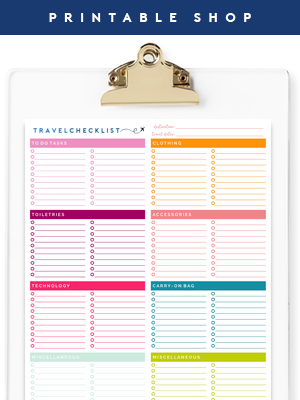 I have been using this for about a year now and thought I got the tip from you Jen the organising master. These bags wash beautifully and don't fade. There amazing. You may have. :) I know I have mentioned it before in emails, comments and maybe even a post here and there, but never actually dedicated a specific post to it. So happy to hear you have been using it and it has been working just as well. xoxo! Jen, This is genius. We use so many rags, in lieu of paper towels, that I dedicated a drawer in the kitchen to the clean ones. But I've been walking the dirty ones into the laundry room each night. I just happen to have a couple wet bags from when my kiddos were babies. I am so excited to add this under my sink. Plus, the wet bags have super cute patterns on them, which is fun! Thank you for posting this! I have three wet dry bags for my son's stuff, so might be able to use one of them or just get a new one! You may want to warn your readers that they aren't all the same! Looks like the brand you got is similar to Planet Wise, which has a great mailable lining and nice outside fabric. I also have a Skip Hop one and HATE IT! The lining on the insides is so stiff, unbreathable, and when washed and dried, still comes out wet. What a simple easy idea. Those are always the ones I gravitate toward when I am trying to make changes at my house. Looking forward to more Quick Tips! I did the same thing last summer! 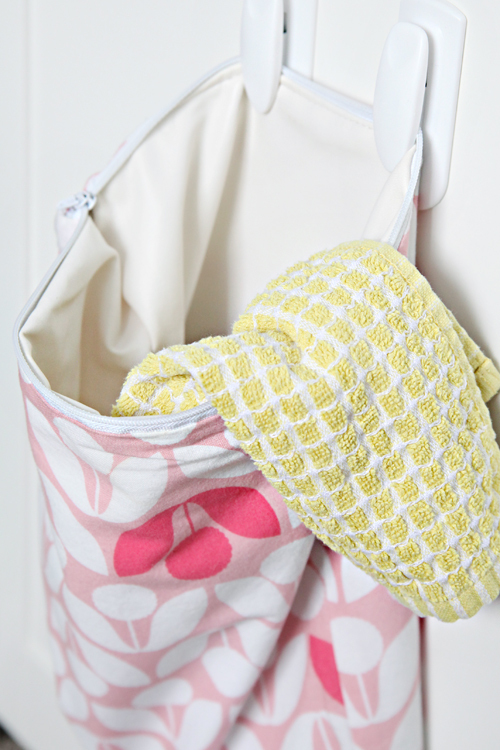 The wet bags are also great in the bathroom for the little one's wet washcloths. Brilliant idea, need this for the kids! Love this...just purchased two bags! Looking forward to Tip Tuesday. So excited to try this out. When you are waiting for the rags and bag to be laundered, do you leave your bag unzipped (like pictured) or do you zip it closed with the rags inside the bag? I typically just leave it unzipped to keep things easy peasy. I am wanting to make the switch from all the paper towels we use to using more cloths and rags. 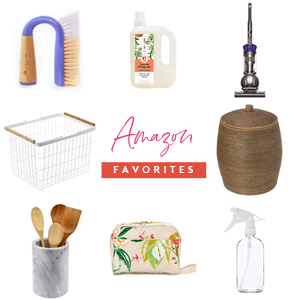 Could you share what your favorite cloths/rags are to purchase? Thanks. Suggestions on how to store clean rags (under the sink) to free up drawer space? Think stacking baskets or drawers, anything to maximize the vertical space. This is a great idea! We just started doing this and its been working like a charm! Great space saver! Love your website, so many creative ideas!